Best price guaranteed. If you can find Villa Miro cheaper, we'll match it. Oberoi, Seminyak is home to the superb Villa Miro, situated within the highly sought after location and most popular area of Bali. 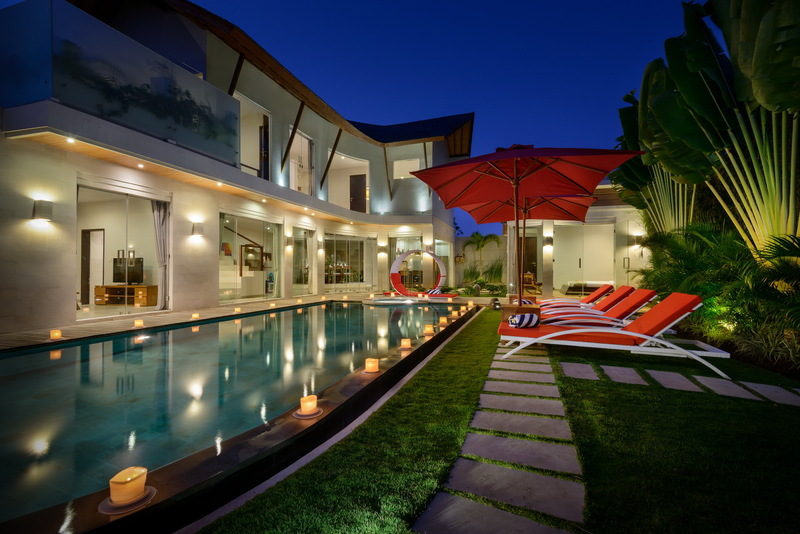 Surrounded by Seminyak’s hip restaurants, fashionable boutiques and trendy cafe’s, Villa Miro is the place to stay. The modern Villa is stylishly decorated with local furnishings and materials helping to create the perfect tropical environment. Floor to ceiling glass doors/windows provide the living/dining areas direct views of the pool and lush tropical gardens. The fully equipped western kitchen with island bench is the perfect place to prepare a snack or maybe a full scale dinner party banquet. A seperate cinema room features a 46” flat screen TV, DVD player, private bathroom and air conditioning. This room can also be converted to an extra bedroom. The large L-shaped pool with in-built jacuzzi is surrounded by a large timber deck with two separate sitting areas with outdoor furniture settings. Sun lounges, a shaded garden bale all combine to make Villa Miro’s outdoor areas second to none. The master bedroom is located on the second level of the villa comprising it’s own lounge area, private outdoor terrace with rattan sofa. Perfectly fitted out the master bedroom offers King size bed, En-suite bathroom and Bathtub, Shower and bathtub seperate lounge area, Double Vanity, 46″ LCD TV with cable channels, DVD player, Buitl-in wardobe, Air conditioning and Safe. The second bedroom provides guests with a king size bed, En-suite bathroom with shower and bathtub, 32″ LCD TV with cable channels, DVD player, Buitl-in wardrobe, Air conditioning and safe Each individually styled bedroom offers king sized beds, ensuite bathrooms with shower and baths, finest bed linen and pillows, fully stocked bathroom amenities, air conditioning, flat screen TV’s and DVD players. The third bedroom also comprises King size bed, En-suite bathroom with shower and bathtub, 32″ LCD TV with cable channels, DVD player, Air conditioning and safe. At Miro Villa you will be served by a warm, friendly and professional team of staff who are all ready to make your holiday in Bali the perfect getaway experience. Officially known as Jalan Kayu Ayu, but known collectively as Jalan Oberoi, this area in Bali houses a diverse and sophisticated range of nightlife. The world famous Kudeta, Potato Head and W retreats are all on your doorstep.